Check out this wonderful blog entitled Vintage Kids’ Books My Kid Loves of “vintage children’s books from thrift shops, library sales, book stores, online and elsewhere”. 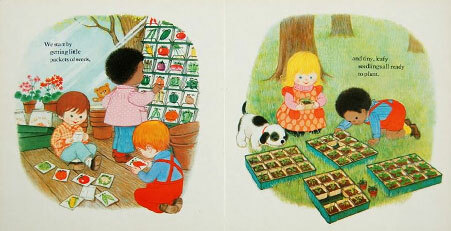 Image from Gyo Fujikawa‘s exquisite Lets Grow a Garden. Incidentally, if you like Gyo Fujikawa, there’s a ton more images of her work on Flickr. OH! Milo has great taste! I loved these books when I was a little one too — and I’m still inspired by Gyo Fukikawa’s works.